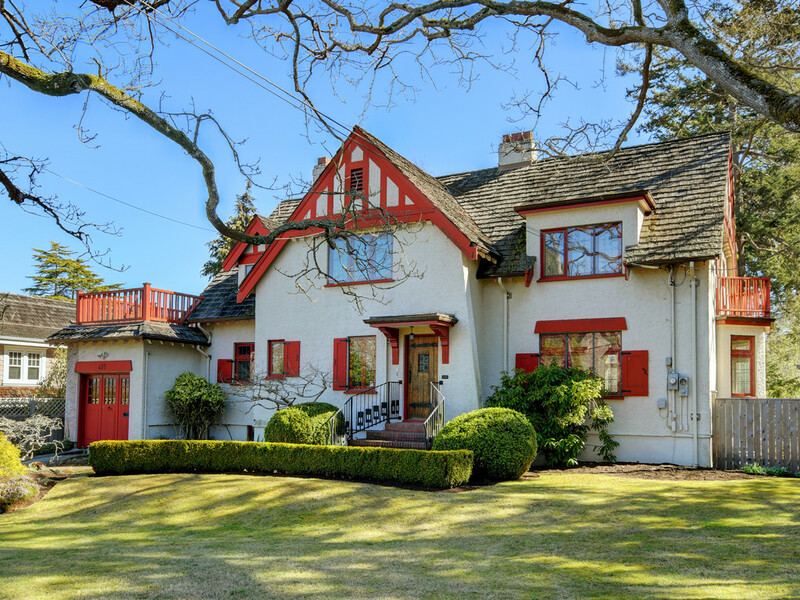 This much admired 1929 Tudor Revival home is set on 3/4 of an acre of transcendental grounds with expansive, mature garden. Truly a utopic and splendid setting for the imaginative Purchaser with a vision to resurrect and reinstate this property to its former grandeur. The moment you step into the formal anteroom with winding staircase and fireplace one harkens back to an age of elegance in South Oak Bay. Enter the grand living room blessed with an abundance of leaded glass windows, prominent fireplace, narrow-planked, inlaid floors and let your imagination soar. Peaked Tudor style leaded doors access the formal dining room and spacious kitchen. Enjoy the character of the period from generously proportioned rooms featuring fine millwork, antique fixtures, hardware which provide a perfect backdrop for antiques and overlook the majestic garden from large picture windows, one could definitely imagine a tennis court on this idyllic setting. Spacious family cedar lined family room could house a billiards table and opens to the outdoors. A charming den outfitted with built-ins provides a cozy retreat and has an adjoining bathroom. Upstairs the Master suite enjoys garden views and has a four piece en-suite. Two children’s bedrooms share another full bath and one has it’s own private deck. Downstairs has a large recreation room with access to an expansive mature garden, a separate suite, laundry, workshop and ample storage. Located close to private and public schools, Windsor Park, Anderson Hill, Victoria's Golf Club, beach and "De'lish"... Oak Bay's answer to fine take-home. Truly one of South Oak Bay’s most sought after locations of prominent homes and tranquil, peaceful properties this stately and splendid residence awaits the discerning Buyer. HISTORICAL NOTE - A TUDOR REVIVAL Beginning in the mid to late 19th century and often referred to as Mock Tudor this form of architecture began in the U.K. and adapted to other parts of the globe. The style evolved from a combination of earlier forms, Tudor, Elizabethan and Jacobean, the emphasis being on the simpler and more rustic aspects of Tudor architecture. After W.W.I the 20th Century Tudor Revival style became popular in Canada and the U.S.A. in older upscale neighbourhoods with larger lots allowing the house to have individual presence to display “olde worlde” charm. Brenda Russell presents 655 Island Road from Realfoto on Vimeo.